Tiny Three Oaks is anything but when it comes to historical significance that segues seamlessly with modern day attractions. 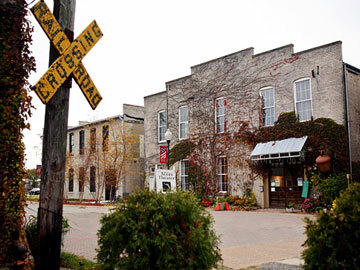 This charming village and former railroad town offers an intriguing blend of Victorian charm and cutting edge culture that will appeal to history buffs and foodies alike, as well as those looking for a unique artistic experience. 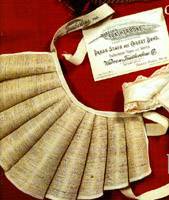 Founded in 1850 by Joseph Chamberlain, Three Oaks was once the international headquarters of the Featherbone Company, a thriving business that revolutionized the corset industry by replacing rigid and expensive whalebones with flexible turkey feathers patented as Featherbone. The former factory is now home to the nationally-acclaimed Acorn Theatre as well as several art galleries. The Acorn offers an eclectic blend of internationally known musical acts, vaudeville comedy and opera and is home to a 1931 Barton theater pipe organ. For centuries, the lush farmland surrounding Three Oaks has yielded some of the best produce Southwest Michigan has to offer, which contributed to the town's early wealth. Regular train shipments between Chicago and Detroit led to a building boom of elaborate commercial and residential buildings during the late 1800s and early 1900s. Many of the Queen Anne, Gothic, Victorian and Italianate buildings have been lovingly restored, and the ornate Romanesque railroad depot, built in 1899, still stands. Froelich's is a lunchtime fixture offering gourmet sandwiches, homemade soup and fresh-baked bread. Drier's Meat Market dates back to the Civil War. Originally a wagon repair shop, the building was converted to a butcher shop in 1875 and is recognized on the National Register of Historic Places. Drier's specializes in meats smoked in their 100-year-old smokehouse. Vickers Theatre is housed in a former livery stable. Restored in the 1990s, it's a regional staple for the screening of independent and foreign films.